The human species has lived in groups for over five million years. Then 100,000 years ago we hominids diverged from our ape lineage and evolved into Homo Sapiens. But we kept living in groups. Living in groups created a deep interdependence because the group’s survival depended upon the cooperation of each member working to protect and serve the group. We never lost that mentality. Even today we all strive to belong. It is hard wired into us. In order for the group to operate and function there was a need to communicate clearly. Once we developed language it required that the spoken word be taken literally. There was a life and death dependence upon believing what was said. If a member said there was a bison herd over the hill the other members didn't look at him and say “No way, you’re kidding…” They acted immediately. There was no time for any uncertainty or misunderstanding. Words spoken had a direct literal meaning. A good example of the automatic nature of our believing is seen in the story of “The Boy Who Cried Wolf” in Aesop’s Fables, which originated almost 2,600 years ago. In the story a young shepherd boy tricks the villagers into thinking wolves are attacking his flock. He runs to them to tell them several times and each time the villagers run out to protect the flock only to find out it was a ruse. As we know from the story, later his flock actually is attacked by wolves but this time when he runs for help the villagers don’t believe him. My point here is that the villagers absolutely believed him when he said he was being attacked. Three times! They didn't hesitate, they believed him and they automatically reacted. This reflects the literal nature of our group communication and our need to believe each other. I believe that same trait is hardwired into us today. We believe what we hear. Yes, over time we developed more complicated and subtle ways of communicating but the basic trait of believing never left us. So when someone speaks harshly to us and criticizes us or says hurtful things, we tend to believe it, maybe not consciously because our conscious mind will argue it away or dismiss it. But underneath, our subconscious mind has heard it and takes it seriously. Our subconscious mind takes those words in and then looks for other beliefs that may match or reinforce the words it heard. It then files them away into the records of a matching negative belief. In this way it gathers more evidence that the underlying belief might be true. First, if you are standing strong within yourself you will hear these words and they will not resonate. Instead they will trigger an interesting observation about the person who said them to you and that will be looked at and remarked upon in your mind. But the words themselves will have no effect. But if you are in a weakened state or you are severely out of balance you may take these negative words in and almost believe them. I say “almost” because I don’t think the words immediately reinforce a negative belief. It's not always automatic. I think the words swirl around for a bit on the surface of your mind as you ponder and review and check in to see if it really is true. That gives you the chance to remind yourself of who you really are. You acknowledge that although you could believe these words you choose not to because you know that they are just words. They have no meaning unless you attribute meaning to them. Unless you allow them to have meaning. You might still feel the tiniest bit of doubt for just a second but try to acknowledge the doubt. Remind yourself that staying grounded and solid is a daily practice, done by the hour, by the minute and by the second. A practice that requires constant practice. By seeing the effect the words have and the feelings they bring up, and by watching yourself have the doubts, the incident can be turned into an opportunity. A chance to get just a little bit clearer about yourself and maybe gain just a little more insight. 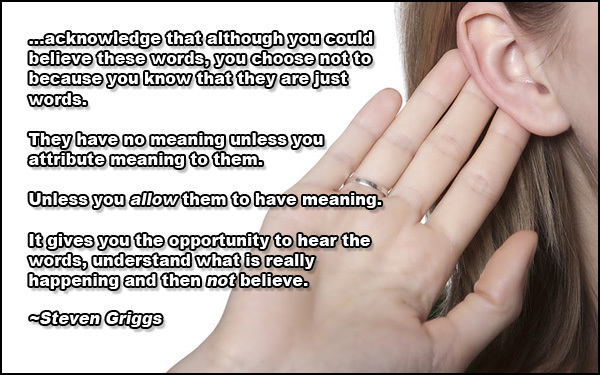 It gives you the opportunity to hear the words, understand what is really happening and then not believe.